I’ve been hankering for fish tacos lately and suggested a recipe I made years ago to Randy that uses grilled red snapper and the classic cabbage slaw as a topping. He countered my suggestion with this recipe which is from a recent Co-op flyer. Since it was hot as blue blazes out, we opted for this recipe in which the fish is cooked stovetop – no lighting and hovering over a grill! This was fast to make and fun to eat. While we made it on a Saturday night, this would be a great option for a weeknight meal. 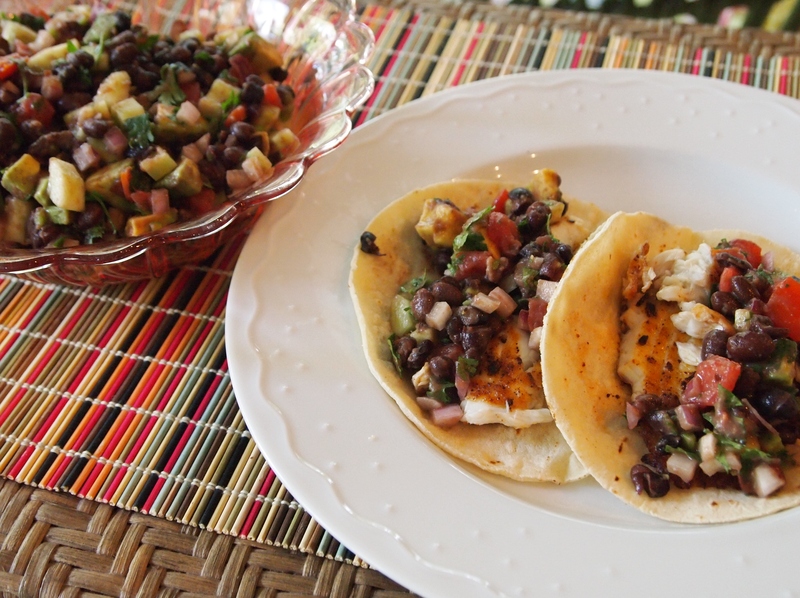 We both agreed that we’d like to experiment with other fish taco recipes, so let us know about your favorites! Look for more fish taco postings soon. Warm a platter in a 200 degree oven. Whisk the spices together, along with salt and pepper to taste, in a small bowl. Rub all sides of the fish fillets with the spice mixture. Add 2 tablespoons oil to a large non-stick or cast iron skillet and set on a medium-high burner. 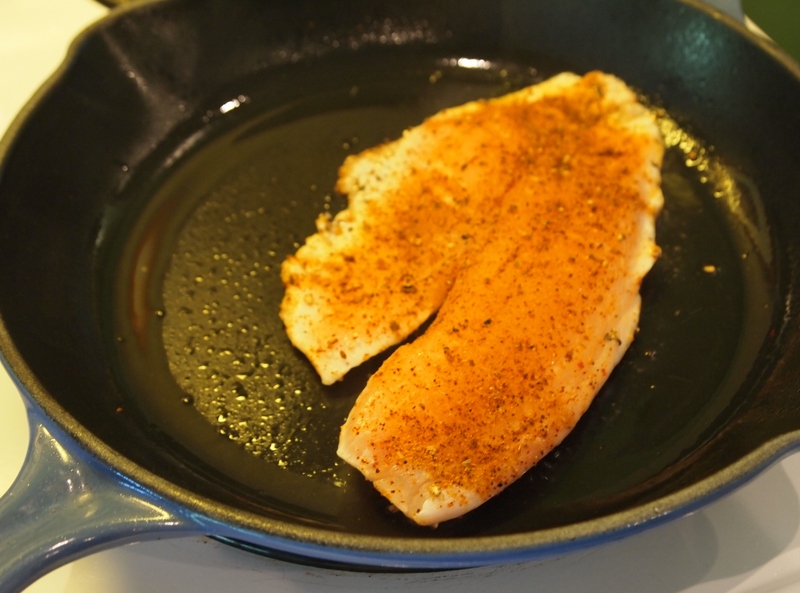 When the oil shimmers, add the fillets, two or three at a time depending on size. Cook until lightly browned and the flesh is opaque, about 2 minutes per side depending on thickness. Transfer the fillets to the warmed platter while cooking the remaining fish. Place the tortillas in foil and warm in the oven along with the fish platter. Cut the cooked fish into large chunks (about 1 x 2 inches). Add 2-3 pieces of fish to each warmed tortilla, top with the salsa and avocado if serving separately. We used the house made tortillas from Cinco de Mayo Mercado in Minneapolis, which are on the thin side. We found we needed to double up on the tortillas for each taco or else they broke through. Even with this problem, we think these are the best locally made corn tortillas around the Twin Cities!